After a year of stitching, here are the very last six strips I have left to sew onto the dragon quilt!!! I’m going to finish the top tonight ~ and I’m sooooo excited, and a little sad. It’s like reading the last chapter in a 10-book-series, and you’re not quite ready to say goodbye to your favorite characters. Yesterday I went into my sewing room sty and realized I have a lot of cleaning to do before I start the next step on this quilt, or start any other. That should be fun. 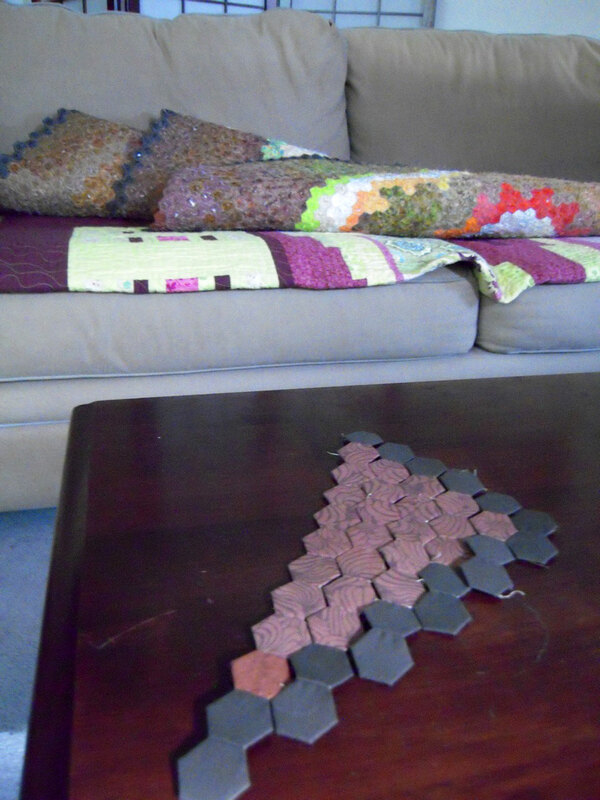 I haven’t really been up there much lately since I do my hand-stitching in the living room… and the dragon layout took up most of the space. I’m working on a list of organizing stuff I need from Ikea, and maybe I can get that room into shape quickly… we’ll see. Hurray!!! Did you finish last night?? I loved seeing your squid quilt at EXPO so I am really looking forward to seeing your dragon quilt "in person." How exciting! can't wait to see it!!! That is so amazing! I am really looking forward to seeing the finished project. Your patience level astounds me! Wow Gail!! That's a really big deal, way to go! I can't wait to see the whole top together!